The Porsche crest has been used since 1952 as an unmistakable symbol of the brand. The acclaimed initiator is Max Hoffman, the American car importer, who asked Ferry Porsche for a visually appealing seal of quality for his Porsche sports cars when he was on a visit to New York. Subsequently, Ferry Porsche had several drafts made as part of a call for tenders sent to art colleges. But Herrmann Lapper, his publicity head, and Franz Xaver Reimspieß, a highly talented designer and artist, supplied him with the solution. At the beginning of 1952, Reimspieß, who is presumed to have designed the Volkswagen logo in 1936, sketched an imaginary crest full of dynamic expressiveness. It symbolised both the roots of the company as well as the quality and dynamism of its products. Centred within the border of a golden shield is a rearing, adopted from the Stuttgart city's official badge. Together with the city name of Stuttgart above it, it demonstrates clear commitment to the production site in Zuffenhausen. The background depicting the red and black colours of the federal state and the stylised antlers are taken from the traditional coat of arms of the State of Württemberg-Hohenzollern. And above the whole image is the binding name of Porsche, acting as a protective canopy. After its registration at the German patent office, the Porsche crest first appeared on the steering wheel hub cover at the end of 1952. Then in November 1954, it was integrated in the characteristic bonnet handle of the Porsche 356. From 1959 onwards, it also adorned the rims and the wheel hubs of sports cars from Zuffenhausen. 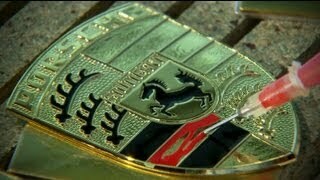 To this day, every Porsche car world-wide appears with the characteristic Porsche crest on the bonnet. 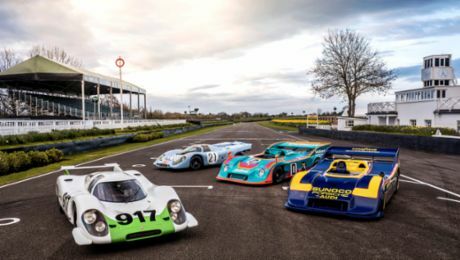 As a result of its widely noticed successes in international motor racing at the beginning of the 1950s, Porsche soon become a well-known manufacturer of unique sports cars outside Germany – along with its company badge. As the number of Porsche enthusiasts increased all over the world, private demand for the trademark also grew. It soon found its way into private homes and wardrobes – in the form of table pennants, lapel pins and decals, cuff links, T-shirt imprints or posters. Some brand aficionados even plant their front gardens with flower beds in the shape and with the colours of the crest. Others wear hand-knitted pullovers with the crest pattern. In the meantime, the Porsche crest, which is protected by copyright and may only be used commercially with the express approval of Porsche AG, has become one of the most famous trademarks in the world. It stands as a symbol of the Porsche legend and is regarded as the epitome of the fascinating appeal which sports cars "Made in Zuffenhausen" exude to this day.